A few days ago Facebook brought back to life a fond memory via the video below, which is of me playing a song I wrote honoring and celebrating this practice and Way I love so deeply and dearly, for the occasion and ceremony of being named a sensei. The lyrics are a great weave of many aspects of practice, the meaning and significance of which will certainly be lost on those unfamiliar with such, and perhaps even others as well. To help illuminate and enliven the territory of it all, I went through and provided links to source material, general information, articles and commentaries, additional resources, and more, for the benefit and enjoyment of the initiated and uninitiated alike. Am I even doing this right? C’mon now – take a drink! A: Ha ha! Interestingly, this was on my mind the other day, for no particular reason as far as I know. And this question has been raised before. It’s another paradox that Zen enjoys embracing: things essentially have no meaning, and they matter deeply. To be more precise, this is not to deny meaning but to recognize that any meaning things have is only for the time being (for as long as that time being is), not lasting and enduring. Realizing that any meaning we assign to things is provisional and subjective allows us to invest ourselves in them in the appropriate measure, not getting overly and hopelessly entangled by them, not standing apart from them, detached, aloof, apathetic. In my experience, not being tethered to or confined by things having some ultimate meaning allows me to give myself to them – and thus to this life and this world – more freely and fully. The movies Rogue One and Cloverfield (we just watched it this past weekend, which works well for these purposes) come to mind. SPOILER ALERT! In both movies all of the main characters die in the end. In one instance, what happened is connected to a bigger story and thus it has greater meaning; in the other, things just end and we don’t really know what happened afterward or what (if any) difference it all made. Looking at these more closely, I would note that there are moments in each movie when the characters come face-to-face with their slim chance of success and the hopelessness of their endeavors, yet they continue on regardless. While doing so, the impact and repercussions of their actions only have relevance to the moment they are in, and any significance or enduring meaning of these actions depends upon what happens in the next moments as things continue to unfold, not upon the overall goal or over-arching ideal that motivates them. It helps to have such goals as motivation, but whether or not they are achieved does not fundamentally add to or take away from the meaning of what took place (again, any meaning is immediate and inherent), though we tend to view things otherwise as a result of using those goals to frame, provide context for and justify our present actions. All of this brings to mind a story about the pianist Vladimir Horowitz, who had friends over for dinner and then played his latest composition for them. Afterward, someone commented on how beautiful it was and asked about its significance and meaning. Horowitz returned to the piano and simply played it again. I’ve been keeping company with The Golden Rule for the past couple of weeks, wondering and being curious about it, and seeing what arises while doing so. When you really look at it and think about it, it’s kind of an odd phrase. This is not a bad thing. In the Zen Koan tradition we have more than our fair share of odd phrases which we hang out with, being curious and wondering about them, and seeing what comes to meet us in the process, and I enjoyed connecting with The Golden Rule in that way. There’s a deeper level and meaning which it seems we go to more readily, due to it being such a well-known phrase, and what I find at the bottom of it is the encouragement to treat others with dignity and respect, as that is fundamentally how I would I like to be treated by others. And I’ll come back to this, but first I want to speak to what I find odd about the phrase, which comes by meeting it on the surface level and taking it at face value. So, The Golden Rule tells me to treat others how I want to be treated. This assumes that I know how to treat and care for myself well, and that I’m doing right by myself while doing so. It also suggests that I should impose this upon others, essentially saying that what’s good for me must certainly be good for them. To some degree it seems to be saying don’t pay too much attention to their individuality and their needs, and instead treat them the same way I treat myself. That’s odd advice. I could also try to use the phrase to my advantage and manipulate others into treating me a certain way. For instance, I love chocolate. So, with The Golden Rule in mind, I decide to give people chocolate on a regular basis, hoping they’ll catch on and realize I am treating them the way I want to be treated. Give me chocolate! Moving beneath the surface level, another reason I find The Golden Rule to be odd is because one of the central teachings of Zen and Buddhism is that there is essentially no me and no you; we are not separate, self-existing entities, but rather are connected and interwoven with one another. We arise together; because you are there, I know that I am here. To be clear, this is not to say that we are all one, for each of us, each thing, has its distinct individuality; this is instead to acknowledge and understand that we are not-two, that we are intertwined and we interpermeate one another continually, in perpetual relationship. And not just us humans and our fellow living and breathing creatures; all things are connected and a part of the same whole. So, to lean too heavily in the direction of one of us – whether it’s primarily acting for myself or giving myself wholly to others – is to violate and dishonor this relationship. Considering this, I was thinking about how here in Colorado we have mountains to the west, and plains and prairies to the east; two very different and distinct environments with their particular terrains and climates, yet both part of the same landscape. In light of The Golden Rule, let’s say that I’m a mountain and you’re a prairie. As a mountain, I’ve come to learn how to be, what I need to survive and thrive, and what’s good for me. Yet, if I treat you, the prairie, in the same I way I treat myself, it will not be good for you; it might be helpful in certain ways, but overall would not truly give you what you need to survive and thrive, and in the end would be quite harmful. So I must take care of myself in ways that are beneficial to my landscape, and support you in taking care of yourself in ways that are beneficial to your landscape, offering what I can when I can, and vice-versa. And each of us can do so while realizing there is a greater ecosystem of which we are a part, and by taking proper care of ourselves and others, we are nurturing and sustaining that greater ecosystem as a whole. This is how it is with us humans and all beings, all things. There is a vast field of existence of which we all are a part; it’s made up of you and me and everything else, our interconnections and interweavings, but is not limited to simply being the sum of these parts – something greater comes about through the deep realization and manifestation of our not-two-ness, and it is to that which I have my allegiance, and that is what I wish to care for and serve, for the benefit of all. The invitation and opportunity here is to allow this vast field of existence to be my common denominator, to be connected to and rooted in it at all times, as I care for myself and others and all things in this world of ours. One of those Zen phrases came to mind as I was pondering this, and I offer it (well, a paraphrase of it) as a companion to The Golden Rule: the way you care for one thing is the way you care for all things. Initially, I notice my mind wants to discover what the one way to treat all things is - the perennial, fail-safe, blanket approach that works in all situations and under all circumstances – because that would make things much easier. Fortunately, I find I am unable to let myself off the hook, which leads me to look for the deeper significance of this phrase. In one respect I take it quite literally, keeping in mind the vast field of existence spoken to above. Because of the interconnection and interpermeation of all things, what I do at any particular moment is a part of that greater whole. An instant of taking a breath and being at peace is an instant of peace permeating the field; an instant of being kind and helping another is an instant of kindness permeating the field; an instant of standing up to injustice and oppression is an instant of resistance and solidarity permeating the field. So, knowing that in this moment, in each and every moment, the way I am caring for things (myself included) affects and contributes to the vast field of the whole, how do I want to carry myself and be and make my way through this life? After meeting with this phrase in this way, I found that there is the possibility of a blanket approach as a way of caring for all things, and that comes back to dignity and respect. It seems to be another helpful common denominator in which to abide and from which to respond, and fortunately what the responses look like are wide and varied. First, to treat things with dignity is to allow and acknowledge that they are here, in this world, a part of the vast field; regardless of how I feel about them and what opinions I hold, they are here, and I offer them the dignity of being seen. And then, to treat things with respect is to listen to what they have to say, find out what they want and need, to notice what they are offering and contributing, and then to respond appropriately. Again, there is no pat, cookie-cutter response, which frees us from always trying to come forth with kindness and gentle compassion, as certain circumstances call for harshness and fierce compassion. True compassion is offering what is needed when it is needed, not coming forth from an idea of what it should look like but as an authentic expression and appropriate response to what is. Responding in such a way honors and nourishes our relationship with all things, that which unites and binds us all. In regard to caring for all things with dignity and respect, I find the first and crucial step is to offer these to ourselves, each of us to allow and acknowledge: I am here, I have a place in this world, I have something to offer and a willingness to contribute. And then we extend this dignity and respect to all things as we arise together, meeting and responding to one another. To a loved one going through hardship and difficulty, we listen and comfort, hug and hold hands; to a stranger in need, we ask how we can help and offer what we can; when a child is acting cruelly, we speak stern words and establish consequences; when we see affluence in one community and lack in another, we engage in programs that are working to address inequities, and notice how we may be contributing to the problem as well as how we can help support the solutions; and in times of tyrants and dictators pursing their narrow, harmful agendas, we stand up, make our voices and presence known, resist and persist, for the benefit of all. I’ve experienced a few losses over the past couple of months. Several people I know have as well. And not just through loved ones passing away, but also loss in relationships, loss of job, loss of functioning, loss of power, loss of a sense of security. If one sits back and takes in a wider view of things, loss in one form or another is happening all the time, in a multitude of ways. Just yesterday evening I was talking with someone about a loss she was going through, and in our conversation impermanence came up – since it’s one of the three marks of existence according to Buddhist thought, it’s a common theme that arises within the circles I travel among. It naturally comes up elsewhere as well, especially in connection to loss, and in such cases people generally take impermanence to mean nothing lasts and everything comes to an end. However, this is somewhat inaccurate and not wholly what impermanence means. While it’s true that nothing lasts, it’s also true that nothing ever comes to an end. I’ll pick that thought back up shortly. First, I want to mention an article that a friend of a friend posted during these past months. The topic of the article was impermanence and the emphasis was on the nothing lasts, everything ends aspect. I found it to be painfully unhelpful. The author’s fundamental point was that we should understand and embrace this, and a result we should embrace life more fully and get the most out of it because we don’t know how long we are going to be around to experience it. The sense I got was that the author was speaking more out of theory rather than as someone who had directly and deeply been confronted with the reality of impermanence; perhaps he had felt inklings of it as it approached then came up with a strategy to keep it at bay, as such things can be unsettling. It wasn’t that he hadn’t experienced loss and hardship and any of the various other difficulties that come with living, but rather that he used his understanding of impermanence as a buffer between himself and life; he may indeed have been experiencing life more fully, yet it seemed he wasn’t allowing himself to be affected by it as deeply and directly. It had a subtle flavor of me-versus-the-world with a tinge of manipulation and how to manage life’s experiences in order to better serve oneself. A truly disastrous approach, in my opinion and experience. The core meaning of impermanence is that things are always changing, and everything is in a continual state of transformation. Yes, loss is one aspect of and within this wider, longer arc of endless transformation, but it’s not the only aspect. That arc also includes gain: at one moment not having something, in the next moment having it. Impermanence speaks to the fact that in life, in existence itself, there is birth and there is death; there is arrival and there is departure; there is arising, there is abiding, there is falling away. We can switch up the order these and still speak to the truth of matters: because there is death, something new can be born; because something departs, the way is cleared for something else to arrive; though something has been abiding steadily for a long time and become quite familiar, it eventually falls away, and within the very space it inhabited something fresh arises and abides for its particular duration. What this clarifies and illuminates is impermanence means nothing lasts and everything comes to an end is redundant statement (nothing lasts = everything ends) and an expression of partial understanding – to complete it, to make it more whole, we must add and nothing ever ends. As we venture into the territory of nothing ends, it’s important to note and consider this: everything is relationship, relationship is everything. In other words, we are constantly in relationship with the world around us and the world within us, and each of those worlds (which are essentially two aspects of one larger world, i.e. existence) themselves are comprised of relationships, those relationships making the world and each of the things in it what they are. Rather than me going on about this more (perhaps I’ll do so some other time), simply connect with how you already understand this through your own experience, or just stop for a moment, reflect upon it now and see what you find. Instead, I’d like to explore how everything is relationship and nothing ends connect to impermanence, specifically through the example of a loved one passing away. There’s no denying that the loss happened and something has ended, yet the relationship continues on, via memories and emotions connected to that person, and via what we go through in connection to their passing away. And even though the person is no longer actively contributing new memories and emotions to the field of the relationship, the relationship remains lively and dynamic. For instance, an old memory of a loved one brings up new joys, present and palpable. Or new sorrows and pains come forth, aching within our hearts and our being here and now. In the course of the day, an encounter with a complete stranger can bring up a memory of the person we loved so dearly, and we suddenly find they are right by our side, intimately with us. There’s also the experience of seeing our loved one – someone we were certain we knew very well, inside and out – in a completely different light as time goes by and we learn about and even from them, our view no longer limited to or constricted by the particular dynamic that arose time and time again whenever we were together. So though the loss happened, the relationship never ends, and we get know the other person and ourselves more and more over time; the relationship with our departed loved one never ends, it simply keeps changing. And since everything is relationship, essentially nothing ever ends. Ever. It all simply keeps transforming. Since this is so, impermanence and its ever-changing never-ending nature certainly doesn’t apply only to the loss of a loved one – it applies to everything all the time. To illustrate this, I’ll make a big leap to something else: The Civil War. This event is in the past, has finite dates indicating its beginning and its end, so it is clearly over and no longer happening. Yet, because I mention “The Civil War” you think of it and what it means to you, and voila! – it’s right here. And though it isn’t actively happening, we can read about its history and accounts of the battles that comprise it – and some people even re-enact it – all of which brings its happening back to life in some way. Even if we’re not looking into it directly or even thinking about it, the reverberations of what happened and the reasons it happened continue to flow through our lives today. And at risk of belaboring the point – and in light of a recent happening – someone can inaccurately remember and proclaim something about The Civil War, and that current happening in some way gets woven into the history that we thought was set and finite, people now finding it’s important to emphasize something that didn’t need much emphasizing previously: Andrew Jackson died 15 years before The Civil War even began. To return to the essential and overall point, impermanence is not only about the fact that things come to an end. Impermanence is a long arc of continual and unavoidable transformation, within which there are endings and beginnings, and these beginnings and endings and everything between and beyond them are constantly changing. Witnessing and understanding impermanence in this way isn’t so we can uphold a certain view or manage our expectations. It’s quite the opposite, actually. Instead of spending time and energy manipulating things and managing perceptions and expectations, our time and energy are freed from such projects. As a result, we can better accept ourselves and the world as we are in this particular moment, and can more easily invest our time and energy here. This makes it possible for us to more fully meet and be with life and the things that comprise it as they arise and as they fall away, and to abide more deeply and intimately with what is at any given moment. This also allows us to more effectively fulfill our obligation to life and to collaborate with it, doing our part in contributing to and co-creating what is to come, finding our place amongst the endless transformations of existence. Two of the recent talks I’ve given are about Unconditional Freedom: the first (Freedom in Times of Oppression) is about the territory of it – or the non-territory of it to be more precise, since you can’t talk directly about something that is unconditional; the second (​The Bodhisattva Way: You Just Can't Help Yourself​) is inadvertently about the effects or evidence of experiencing Unconditional Freedom - something I didn't intend and didn’t realize until afterward, in light of a question that someone posed. This question came up after the talk had concluded, while we were wrapping up, so it only received a partial response and we didn’t take time to look into things much further together. Since it is an essential question to be asked, it kept rolling along with me, and though responses to it are contained within the two talks I wanted to respond to it directly and more succinctly here. Let’s begin with the satisfying part: a conditioned being can't experience Unconditional Freedom. This makes perfect, sound sense logically. Unconditional Freedom cannot be experienced within conditions, it cannot be captured or spoken about because to do so would bring it into the conditional realm. Additionally, there are no paths or ways of being that can be devised to help one experience it, because such things are marked by contingency and conditionality. So a person cannot truly say “I have experienced it” or “I am experiencing it,” even though from an absolute standpoint both statements are indeed accurate: all beings are endlessly experiencing Unconditional Freedom because it is experience itself, it is existence itself. Yet to affirm it doesn’t do, and to deny it doesn’t do, either. The crux of the matter here is conditioned and unconditioned are not opposed to one another, nor do they exist in mutuality with each other – they are completely independent of one another. Conditionality is of the realm of time, space, dimension, change, qualities, concepts; un- or non-conditionality is timeless, boundless, immeasurable, unchanging, beyond description, beyond knowing – it has no realm, and because of this, infinite realms exist within it. In regard to the theme of this post, this is to say conditioned reality exists as a facet of unconditioned reality. (And yes, an overdue disclaimer that to write a post saying so may be the ultimate contradiction, but hopefully it provides the gist of things and points to/illuminates something helpful.) Thus, the reason conditioned paths cannot lead to Unconditional Freedom is because there is no separation in the first place, they are not two, you can’t get to where you are already. Likewise, a conditioned being cannot experience Unconditional Freedom because it cannot not experience Unconditional Freedom. Once more, Unconditional Freedom is all that there is; it is what is. Therefore, by extension, a conditioned being cannot help but experience Unconditional Freedom. A term for that blank is suchness, and a term for the experience of suchness in the context of Zen practice is realization. As you may intuit, it’s not realization via the common route of studying something, getting the concepts down, connecting the dots and as a result having a moment of “Eureka! I found it!” It moves in the other way: things are undone (mostly of their own accord, yet with a little help), concepts deconstruct and fall away, the bottom falls out, and the reality of Unconditional Freedom (aka suchness) shines forth vividly. It is always shining forth, actually, whether it is realized or not; as Torei Zenji says: “In every moment and every place, things can’t help but shine with this light.” And whether it’s a momentary glimpse or a longer gaze, it can’t be unseen. And the seeing or experiencing of suchness having happened, things transform. This is where the evidence and noticeable effects of the experience of Unconditional Freedom come in. And though there are many such statements and accounts throughout the history of Zen, realization isn’t relegated to the past…in other words, we’re not meant to ride on the waves of others’ realization but instead are meant to and can experience it ourselves. As stated before, this is because Unconditional Freedom is outside, beneath, and beyond time and space; it doesn’t belong to any particular place or person or thing – it simply is. And the experience of it is possible, regardless of the conditions of time, space, circumstances, etc. It's happening all the time and endlessly, and to illustrate this, I’ll share an experience with a student that happened not long ago. We both sat back and shared a smile – nothing to assert or explain, nothing to deny, allowing it to speak for itself. In closing, I’ll return briefly to my initial response of ​naturally​, as all I have written here falls under its umbrella. Unconditional Freedom is - timeless, boundless, immeasurable, unchanging, beyond description, beyond knowing – naturally. Humans try to know it, find their way to it, describe it, capture it, create formulas to invite and invoke it – naturally. This is simply the way things are, naturally – there is no conflict or fundamental problem here, nor anything that needs to be fixed in this no-realm realm of these two-that-are-not-two. And lastly, regardless of opinions and agreements or disagreements and howevers or furthermores, and regardless of everything I’ve written here, Unconditional Freedom shines forth freely, naturally. I get a bit cantankerous when I see how Zen is co-opted, appropriated and bandied about in popular culture. It happens quite regularly, so I’m regularly in touch with my inner curmudgeon. All sorts of these things come across social media, and the usual manifestation of such is something light and fluffy that brings about a sense of peaceful ease, and often hints at or openly promotes being in the present moment and being mindful. The irony here is what is being offered as a solution actually highlights a major symptom of the disease itself: putting oneself/one’s self at the center of things. You don’t have to travel too far into Zen teachings to find that one of major obstacles to living generously and effectively is the self. As I like to say from time to time, Zen practice is not so much about taking care of yourself as it is about getting over yourself. This brings forth another delicious irony: in order to get over yourself you have to take care of yourself to some degree, to appease that self just enough so that it stops dominating the territory and obstructing the view, to allow it a satisfying modicum of contentment so it can wander away from the center of things and settle down a bit. So I’m not tossing out all the light and fluffy stuff completely. I just want to be clear that, in the course of Zen practice, tending to and caring for oneself in such ways is not where the journey ends but what clears the way and makes it possible for it to truly begin; and though they aren’t the most important steps to take within the overall journey, there is something essential about taking such steps. Mmmm…irony mixed with paradox served in a clearly clouded dish! What prompted this response of mine was recently encountering “10 Zen Things to Remember”, a little animated offering (click on that title to view it). After initially meeting it with sighs and eye-rolling and thinking I would let it drift on by, I was instead inspired to find and present some stories and sayings from the Zen Koan tradition to accompany each of the points being made. Some of these will support the statement, going further into the territory it points to; some will offer an and also to the statement, to accompany it and widen the territory; and others will simply toss the statement out onto its head. Regardless of the specific intention of each, they all carry the general intention of being helpful in their own way, which is true of all koans, no matter how strange and unhelpful they seem. And if you’re wondering which is which in regard to the three possibilities I mention above, I’ll simply say that since I see the animated offering overall to be in putting-oneself-at-the-center spirit, the koan I offer to accompany the title is of the final sort. As to the rest, enjoy keeping company with them and seeing what you discover along the way. After a few recent unsuccessful attempts, Yunmen once again went to Muzhou’s one-room hermitage and knocked on the door. Muzhou said, “Utterly useless stuff!”, pushed Yunmen out, and shut the door. Meditation in the midst of chaos is a thousand times better than meditation in the midst of stillness and silence. Nanquan worked hard until the evening but the monk never came, so he returned home very hungry. The stranger had cooked and enjoyed a good meal by himself, then thrown out the leftovers and broken the cooking pot and all the utensils. He discovered the monk sleeping peacefully in the empty hut, and as soon as Nanquan lay down to go to sleep himself, the monk got up and left without a word. Seijo lived alone with her son, and eventually she came to study Zen in earnest. Her meditation ripened, and true doubt solidified in her mind. 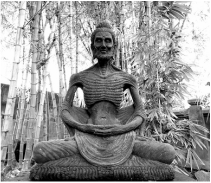 She would meditate all day and forget to cook, so that when her son came home he had nothing to eat. The neighbors used to take pity on him and feed him. It went on for several days like this when suddenly she had an awakening. "Nothing will do. What do you do?" This is the fundamental koan, the koan that is the common denominator of the thousands of koans. This phrase has been keeping company with me of late, and I’ve offered it to others as well, to consider, ponder, explore, be befuddled by. Because while there is something that intuitively makes sense here, there’s also a “huh?” factor. I've found myself inclined to unwrap it a bit and look into the territory more thoroughly, so thought I’d exploring three main aspects to which it speaks and share what is being brought forth and revealed. This is the first thing that jumps out for me and justifiably so: it’s the primary place from and through which we experience the world – our individual lives, our problems, our plans, our hopes and dreams. Trying to manage and understand these is what regularly brings people to take up a meditation practice: we want to reduce stress, learn to relax, be present, find peace, deal with our lives more effectively, and more. Meditation is often packaged as something that can deliver these desired results, and this isn’t false advertising – it can certainly make good on all of these. The issue here isn’t the meditation, it’s taking up such a practice in service of the self, or in a self-serving way, which is where the your own of the above phrase comes in. Your is such a limited, confined territory, yet within it there are limitless projects that can be taken up. Resolve one issue and up pops another, or perhaps when trying to tackle one problem it splits and multiplies instead. Backward and forward and round and round we go: the self-improvement project perpetually providing fuel for itself to continue on and on. And it doesn’t matter if we feel like we’re getting nowhere or if we achieve some level of success in managing all of this; the cycle keeps rolling along, which leads to another aspect of that opening phrase. There are two qualities to settle that I notice here, and the first is in the sense of settling into something, like a home or one’s particular place. I’m thinking along the lines of when we’re successful at managing our lives – we’ve lowered the stress, are finding peace, feel increasingly present and effective – and we set up camp there. In doing so we’re setting up a territory that needs to be maintained, protected and even defended at times. We want to hold onto and nourish all the good we’ve worked for and developed, so we have to be wary of that which may challenge and threaten it, lest it should be diminished, lost or taken from us. To some degree we build walls around that which we value in order to preserve it, and in doing so we can end up closing ourselves in and cutting off connections and access to other possibilities. This leads to the other quality of settle, which is in the sense of things being good enough that we’re willing to quit while we’re ahead and cash in our chips. While we know there could be (is) more out there awaiting us, we’re not certain of how or when or if we’ll find it, so we choose to stop and hold on to what we’ve got. Why risk losing it? Or maybe it doesn’t feel risky at all. We’ve checked off all of the boxes on the list and have arrived, perfectly content, so we hang up our traveling shoes and leave our searching and seeking days behind us because, well, what more could we ask for? We’re happy. You may have noticed a common thread of "limited territory" running through this post. Happiness is another example of such a territory. It’s limited by what we think it means and how to get to it, and what life will be like and how we’ll feel when we do. We’ve inherited some ideas about happiness from our families, other ideas have been given to us by our society and culture, and others we’ve developed on our own as we’ve made our way along through this life. Regardless of where these ideas of happiness have come from, one thing they have in common is this: it certainly isn’t here. So we have to figure out how to get there, and just like the idea of what happiness is, we also inherit ideas about how to reach happiness as well as come up with our own ways to get to it. Such paths are typically made up of a bunch of requirements: who we must be and what we must accomplish, achieve, develop, possess, get rid of, etc. Sometimes we find the steps on this path seem insurmountable, yet we keep at it nevertheless because of the promise of what awaits us. Other times we may fulfill all of the requirements but still don’t encounter happiness, or at least not the happiness we expected. Thinking our list must have been faulty or incomplete, we add more requirements, devise a new plan, create a new path, and set out upon it. On and on and on. What happens if we reduce, remove or don’t create any requirements at all? What if we let go of the concepts we already have about what happiness is and don’t generate new ones? What if we stop saying it’s not here? (To be clear on that last point, this is not about affirming it is here or this is it, but simply giving up the habit of negation.) Essentially, what if we have no ideas about what happiness is or how to find it or who we have to be to deserve it? Don’t limit yourself to your own happiness. Yesterday evening I participated in a student-teacher ceremony with someone asking me to be their teacher. It is a sweet and simple ceremony, mostly about connecting with one another and exploring what it means to each of us to be and to have a student and a teacher. I always enjoy hearing what it is for others and finding what it is for me as we both inquire into it. Each time there is something new and fresh from both sides, as well as some common currents that run through all such explorations. One thing I find coming up for me again and again is that one of my primary functions as a teacher is to become redundant, to help another come to the point where they don't need a teacher. When that point is reached, however, the relationship doesn't come to an end; it simply continues on as it has all along, for no particular reason, just because, and it's lovely through and through. ​Having recently reconnected with this hope of becoming redundant and finding it still on my mind as I was mowing the yard earlier, I found myself pondering the systems of dependency we have in our lives. There are the external systems: institutions of faith, society, cultures, consumerism, etc. And there are the internal systems that we ourselves build over our lifetimes, becoming our habits of thought, action, perceptions, etc.. Part of a meditation practice is becoming aware of these systems and noticing how some might support us while others might hinder us. Looking into these matters, our relationship to these institutions naturally transform: some drop away by themselves, some we work to dismantle and release, some we allow to be enhanced and fortified. Along with this transformation of the relationship comes a transformation in our dependency upon them, even the helpful ones, and over time we come to realize that we essentially need not depend upon anything. ​That sounds a bit harsh, so to expand upon it, it is to realize there is nothing particular upon which we need to depend; we needn't narrow the field of our options and what is available to us. Not narrowing the field, we find that what we need is always at hand, we are able to meet it fully and directly and access it, receiving support and nourishment. We don't have to hold onto it - it is always here. And if we are holding onto it, dependent upon it, we might miss out on meeting the next thing that comes to us and makes itself available. This calls to mind the adage about needing to use a raft to cross a river. Once the river is crossed, you don't strap the raft to your back and carry it with you - you leave it behind. Perhaps as you enter the path into the trees beyond the river you pick up a walking stick, using it to help you navigate the way ahead. And when it's time to put that down, you do, then move ahead to see what awaits. Journeying along like this, with hands and eyes open, you can trust that what awaits, what you need, will find you. It's already here. ​ "What are you doing?" "I'm searching for our old teacher's sacred bones." ​ sacred bones are you looking for?" ​ "This is really good; it makes me strong." ​I've long been curious about and appreciative of the statement "this is really good; it makes me strong." Is he referring to the words that his friend offered, did they snap him out of something and wake him up? Or is he explaining that his activity of searching the hall with spade in hand is simply what he needs to do, and by allowing himself to do it he is fortified? Or is he strengthened by connecting deeply with the feeling of loss and longing for his teacher, by not trying to manage or control those feelings but instead allowing them to spur on this strange behavior? It seems to me it is all of these; they are all in the field of what is happening. By abiding intimately and openly in that field, not rejecting or trying to fix anything, depending upon nothing, he is welcoming what each of these is offering. And it helps. ​To be clear about this "depending upon nothing," it is not about distancing ourselves from life or detaching from it or getting rid of any part of it. Rather, it's quite the opposite. It's about being fully immersed in life and all that comprises it; it's about abiding with the whole of life from our particular place within it; it's about allowing the field to remain vast and broad, not narrowing it down with our selecting and rejecting, welcoming what comes, meeting it and working with it as we must, in deep relationship with existence itself. And through such a relationship, we find that in all places, at all times, across varying circumstances, we always have just what we need, and it carries us through. ​The empty, aching space within your chest at the loss of a loved one - just what you need, carrying you through. ​The flash of angry heat through your body and the thoughts and words that spill out as a result - just what you need, carrying you through. ​The unexpected and un-asked for joy and gratitude that arise when you simply look out upon the day - just what you need, carrying you through. ​The embrace from a friend, the harsh words from a lover, the unencumbered laughter from children playing - just what you need, carrying you through. ​The dripping black heart spray-painted on a trail marker when I was out for a walk, and the bench upon which I sat and rested later - just what I needed, carrying me through. Whenever someone joins us for meditation for the first time or I am speaking to a group of people who are relatively unfamiliar with Zen practice, one of the initial things I find myself saying is the practice is not about importing anything or taking on a specific belief system, nor is it about getting rid of anything or discarding a belief system you may already have. It’s about showing up as you are and noticing what it is like to be you. Over the course of time, beliefs that one has (whether based on other religious/spiritual traditions or formed through personal experience or both) tend to loosen up, fade, and fall away, but it is an organic process, not a requirement. There is also a tendency to want to replace the beliefs that have dropped away or been discarded with new, “better” ones – it seems to just be human nature to want to believe in something. Recognizing this, Zen does not out and out reject belief, it just doesn’t give a person any particular belief to grasp onto, as a way of bringing balance to the tendency to want to believe. In that balance there is an invitation: to live and abide in between, among and beyond belief and non-belief. Throughout the life of my practice, I have been and continue to be curious about this, so essentially I don’t believe what I just wrote – I’m still looking into it. I keep trying to find something that I connect to or uphold as a belief, but I have yet to do so. It’s simply the nature and spirit of the practice: take in what the ancestors teach, come to know it well, see how it informs and affects the living of life, and keep looking into it; notice how I see the world based upon my experiences of it, become aware of my biases and habits of thought and action, see how they inform and affect the living of life, and keep looking into it; notice how life itself shows up, partnering with and filtered through the above, see how it appears to be through the living of it, and keep looking into it. Don’t get me wrong. I certainly have ideas and assumptions about myself and others and the world, yet I recognize them for what they are: ideas and assumptions. At the bottom of it all is an acknowledgement that I don’t know the way things really are. Acknowledging and embracing this not knowing is a significant feature of Zen. Mind you, it is not an aloof, uninterested, shrug-of-the-shoulders approach to life. Quite the contrary. It is a deeply engaged and profoundly curious approach, a willingness to endlessly endeavor to discover what is, released from any expectation or requirement of ever actually finding out. It’s a realistic and pragmatic approach, connecting us with the ever-changing uncertainty of life itself, something to be cultivated, which nourishes us in return. Yes, meditation seems to be good, but that depends upon one’s definition of good. Usually it’s something positive, light, enjoyable. What happens in meditation isn’t always good in that sense, though. Sometimes it can be quite challenging, difficult, harrowing even. Yet going through that darker, heavier stuff does tend to be good overall and worthwhile to work through. So in that sense one could say meditation is good. But perhaps saying meditation is beneficial would be better, as that can include both positive and negative happenings. But it’s not always beneficial. It can churn up things that aren’t ready to be churned up, so you might have to take a break from it for a time and maybe seek some additional support. But had you not meditated, that stuff might not have come up, and those were some important issues to address so…meditation is good in that it helps bring up things that might have remained stagnant otherwise. Perhaps I could say meditation helps things happen. But wait…those things are already there and are already happening. Meditation simply allows me to notice what’s going on, by making time to be still, be quiet, pay attention. Ah, that sounds good: meditation helps one notice what is happening. That’s fairly universal and objective, beyond being good or bad or any of that, and something I could say I believe in when it comes to meditation. And yet I would not say such a thing, which points to the crux of the matter: I don’t need to believe that meditation helps me notice what is happening because I experience it directly each time I meditate. Upholding it as a belief begins to solidify what is fluid and dynamic. It could lead me to see it as a given and take it for granted. I might also add value to this belief, promote and protect it, and perhaps even try to convince others of its validity and worth, all of which would serve to disconnect me from the live happening of it to an extent. I’d rather stay connected to that live happening, knowing it for what it is, again and again. To illustrate this from another angle I’ll take up something that is seen as a general tenet (more or less) of Buddhism and Zen: karma. “Certainly, you believe in karma, right?” someone might ask. “Yes and no…heavier on the no,” I’d reply. The yes of it is yes, I believe that there is something called karma. To break it down some, at its root karma means action or activity, more specifically the nature of cause-and-effect, simply meaning when something happens, something else happens as a result. That’s the essence of karma, and where I find there is no need to believe in it. I directly know and experience the happening of cause-and-effect on a daily basis: I flip the switch, the light turns on; I put food in the bowl, cats come eat; clouds clear, the sun comes out, snow melts; someone snaps at me, I snap back…or I take a breath and speak calmly while explaining myself, the person responds a certain way based on how I responded, and on from there we go. Nothing at all to believe in here. The no of it applies more as we enter the realm of good and bad karma, assigning value to it, making it more tangible as an idea, talking about being bound by karma and promoting ideas of how to release ourselves from its grip, assuring ourselves that karma is going to catch up with a certain someone (hopefully sooner than later, and hopefully we’ll be there to witness it). Sure, negative actions tend to have negative consequences and positive actions tend to have positive consequences, but things don’t always work this way. Sometimes I think I am doing good for another and end up creating difficulties, and other times I am certain I have caused harm to another, then that person ends up thanking me. Yes, it is worthwhile to have ideas of what will be helpful and what will be harmful and to let them guide me along, yet it seems more important to pay attention to what effect results from offering what I offer, then to allow that effect to become the cause for what I offer next. Rather than act upon reality based upon a belief of what our actions will cultivate and where they will lead, it seems better to stay connected to the live happening of it (you may be noticing a theme here), and to notice and take part in the continual unfolding of cause-and-effect directly. I’ve been singling out karma here, but with anything that may be viewed as dogma or a tenet in Zen practice, there is the encouragement to not take it as being true yet don’t dismiss it, either. Inquire into it, be curious, explore and see what arises to meet you. This approach is consistently encouraged, supported and nourished by all the ancestors of this tradition, going back to the historical Buddha. Sure, they left behind teachings and writings and ideas of how things are, but they are offered in the spirit of: This is what I’ve found to be so in my lifetime. Don’t take it to actually be so but please consider it and look into it. Notice your own experience and hold it up to these teachings, and hold these teachings up to your own experience. Notice what reality itself shows you. Invite these teachings, your experience and reality to mingle together, notice how they meet, notice how they diverge. See how it is for you, in your life, in the world in which you are now living, and keep looking. What it comes down to is that it’s simply a more realistic approach to living. There is an openness and fluidity in this not knowing that connects and harmonizes with the openness and fluidity of life. In short, life is uncertain – why not meet it with our own uncertainty, coupled with a deeply engaged curiosity? Not only does this prove useful in our day-to-day doings and beings, it is also useful in the bigger picture of humankind’s steadfast search for (along with veracious claims to have found) the absolute truth. Journeying along throughout the weave of provisional and absolute truth, I need not believe anything offered about myself, the world or existence as a whole, whether it comes through teachings from religious traditions, is reflected by my society and culture, is told to me by family and friends, or is encountered through my personal experience. I need only look into what is before me. If a truth is absolute and eternal, then it will show itself every time I look, so it is not necessary to establish or uphold a belief about it. Likewise, if a truth is provisional (keep in mind, a mountain is just as provisional as a mayfly, it’s simply that their specific manifestations of this provisionality endure for quite different spans of time), it may show up consistently for a while but will eventually change and fade away, so it’s good to keep looking and notice this. On the other hand, if I am holding onto a truth that is provisional, I might miss the truth that is appearing in front of me, or dismiss it because it doesn’t match up to my expectations or what I believe to be true. All in all, what it comes down to is being in touch with the live happening and ever-present manifestation of truth, and not restricting or confining it with ideas and words and what have you. Still, given all this, one may wonder: is there an ultimate, absolute truth? As I see it these days, my response is yes, but we can never know it, and by know I mean define, capture or articulate it. We can’t know it, but we can be it. That’s a sentiment I’m stealing from the Tao Te Ching, one of those texts and teachings that I keep looking into over the years, and that keeps resonating deeply with my experience of living and being in the world. I’ll share the entire verse from which it comes below, which states more succinctly (albeit enigmatically) what I’ve been rattling on about here. In fact, this spirit is woven into the Tao Te Ching as a whole, the text beginning with a statement that anything one can say or know about the Tao is not the Tao, followed by an additional eighty chapters of saying what it isn’t…and not saying what it isn’t. After all, what’s a person to do? We have words and they help convey meaning, so let’s put them to use. While doing so, though, perhaps we can understand this saying and not saying, this knowing and not knowing…and keep looking.